Close to Home | A Watercolor Landscape Journey Begins Tomorrow! The more I practice my art and the more comfortable I become with my chosen tools…the more I have a deep desire to take them everywhere. I remember around the time I came up with the idea for The Living Studio retreats that I was missing creative opportunities because I was not prepared. I had left my sketchbook and pencil at home. I had wished I had stuffed a small watercolor set in my bag. I was seeing other people connect with nature or a museum and I deeply longed to change my day to day planning so I never felt like I couldn’t create if I wanted to. Fast forward a few years and I don’t leave the house without at least a small journal and pencil. More often than not you will find a traveling “studio” stuffed in my car so when I want to practice I have no excuses. It has changed my creative heart, my creative practice and impacted the quality of my art greatly. 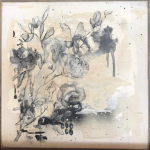 I am so thrilled to tell you about a beautiful artist that I have been drawn to because she lives the life of practicing her art. Meet watercolor artist Michelle Wooderson. My name is Michelle Wooderson and I reside in very rural Kansas with my husband, two daughters and yellow lab Charlie. I have been around art all my life, starting with helping my mom put together art projects for Bible School when I was very little. I grew up watching her tole paint and make crafts and from there I have loved art ever since. I took every art class up through high school and continued my college education with a degree in Interior Design. I worked jobs drawing floor plans and designing office spaces up until my girls were born. My desire to stay at home was so strong that I became a full time mom. The creative urge was always tugging at me so for almost 20 years I’ve been involved in the paper crafting industry. I also have an online shop which has slowed down some but was always bursting with creative kits I designed. Now that my girls are almost both in college, I have felt the need to find where my next creative journey will lead me. Art was calling me back. The desire to play with paints and pencils again really pulled at my heart strings. So here I am today, creating sketchbooks filled with watercolors and mixed media paintings. I have always loved teaching and was thrilled when Jeanne contacted me about hosting a class. I believe in sharing our journeys with each other. We are all at different seasons of life but belonging to a community and sharing what you love is very special to me. You just never know who might need some encouragement or where you’ll find inspiration along the way. Pablo Picasso said, “The meaning of life is to find your gift. The purpose of life is to give it away.” So true. 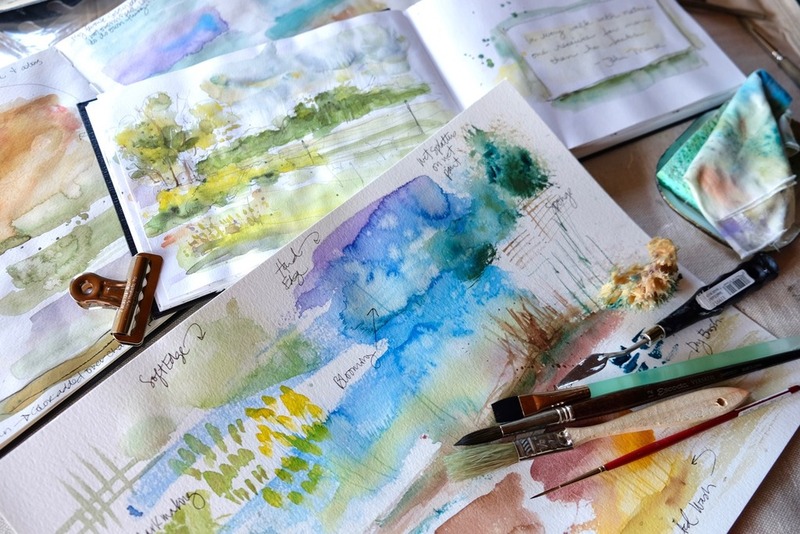 Go grab your sketchbook, pencils and watercolors because Michelle is about to take you on a watercolor journey that WILL change your day to day creating and how you interact with the world around you! 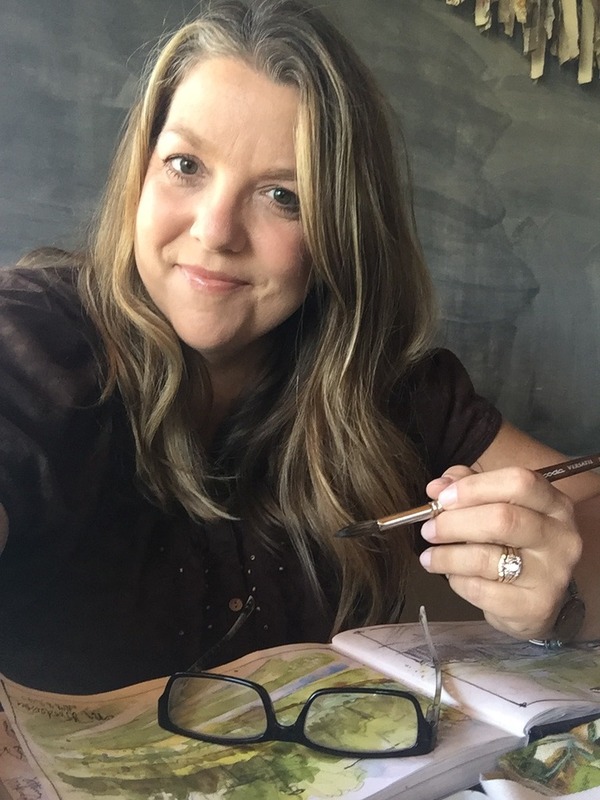 You can still register for Close to Home | A Watercolor Landscape Journey. Robert Henri said, “The object isn’t to make art, it’s to be in that wonderful state which makes art inevitable.” I believe there is an artist and a desire to create inside all of us. It’s that little push and a little guidance that might be just what you need to get you started or back on your art journey. It’s all as close as your back door. There is plenty of inspiration to be found right around us and for me it’s beautiful landscapes close to where I live. In this class we will evaluate where we are in our creative journey and set some goals for what we want to achieve in this class. We’ll explore sketching and watercolor supplies and set up a custom watercolor palette and travel sketch kit. We’ll review the elements and principles of art and revisit the color theory and create a beautiful color wheel using your choice of paint colors. Digging into your supplies and exploring what they can do is the best practice for getting to know your tools. We’ll test out our brushes and tools to see what kinds of brush strokes and mark making we can make. Then we’ll play with the watercolors to see how colors mix and washes and textures are made. Sketching is key for setting up your landscape scenes. We’ll learn why pencil sketches that show value and composition are so important to create before we ever pick up a paintbrush. We’ll create a value scale that can be kept with your supplies and learn how to select the best scene for our paintings using a viewfinder. Eventually all the techniques we learned will be put to the test. 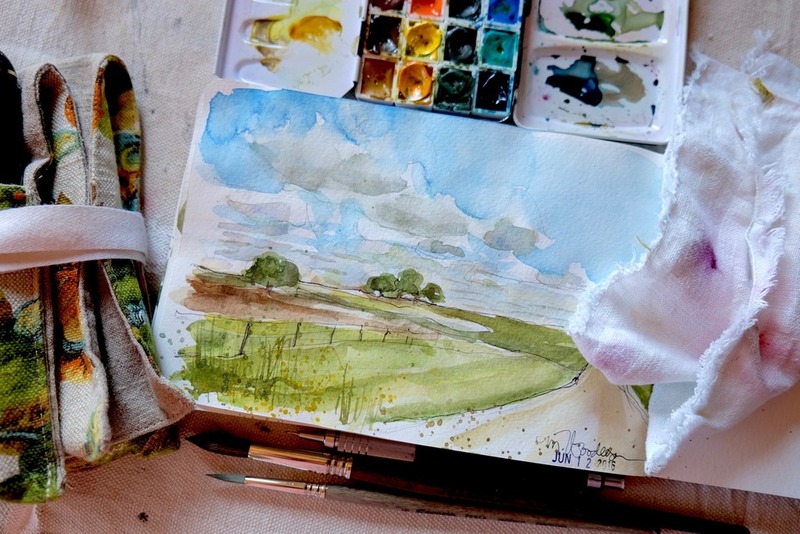 We’ll start with simple shapes and work our way up to painting detailed but simple landscapes in our sketchbooks, learning tips and tricks along the way for creating skies, clouds, trees, grass and small details that make landscapes pop. We’ll create watercolor landscapes that are just for fun and experimenting. 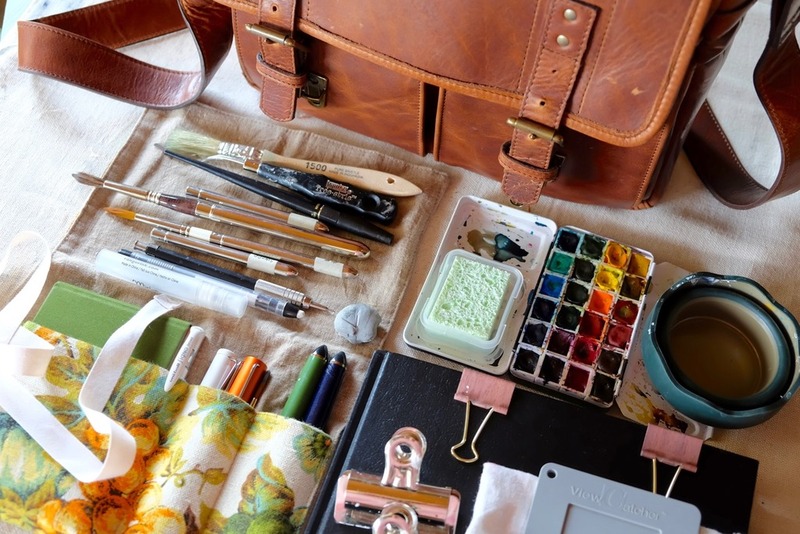 We’ll learn how to create a travel sketch kit, pack it all up and head outside. Sketching and painting from real live nature scenes is the best practice we can get. Lastly, I want to us to learn that practice is art (#practiceisart is my favorite hashtag). We’ll talk about daily practice (or practicing often) and how it will help us grow as artists. 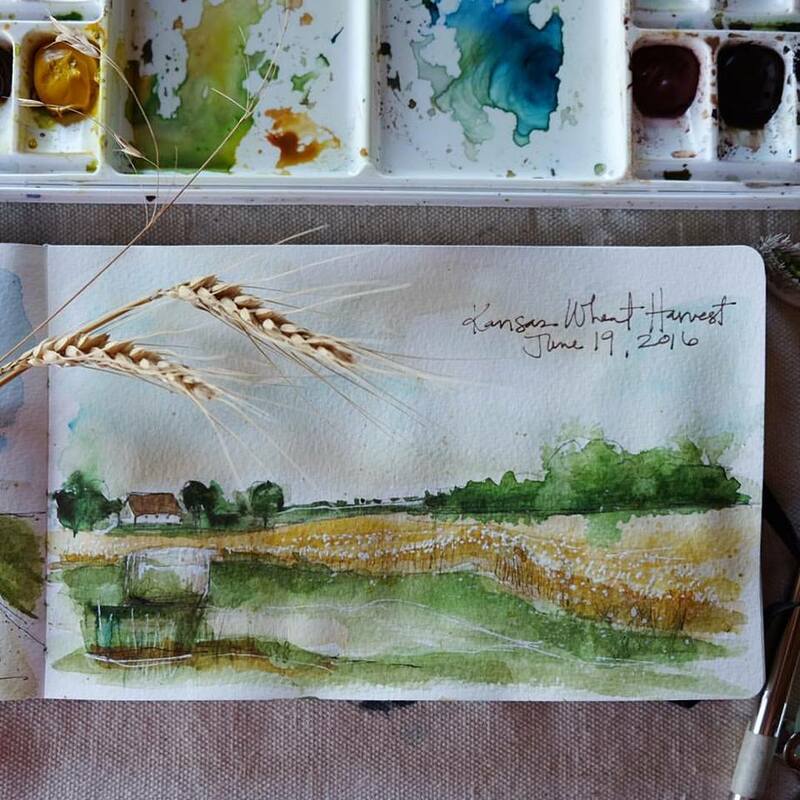 The registration price is $46 for Close To Home | A Watercolor Landscape Journey. The course will have 5 1/2+ hours of content, all videos will be pre-recorded for your convenience and has lifetime* access. For some reason I am not able to get into the Water color class site……It keeps saying this page is not available……I was not able to get in yesterday evening or this morning.